Make sure to turn on your printer but keep USB cable unplugged until instructed during the installation process runs. Insert HP Laserjet M1005 CD/DVD on your computer drive. Click setup.exe to run the printer setup wizard then follow on-screen instructions. When prompted, connect the printer USB cable to computer USB socket. The wizard will detect your printer and complete the installation process. After finished, please print a test page to make sure everything is fine. Please download driver file according to your operating system from above links. The installation process principle the same as if you are using a CD/DVD drivers. Run the driver file on your computer and wait until it ask to connect printer USB into computer USB port (Please make sure if the printer is ON). The wizard will detect HP LaserJet M1005 and complete the installation process. Make sure your computer connected to the internet. On Windows Desktop click Start, and then click Devices and Printers. In the Manufacturer column select HP then select HP Laserjet M1005 on Printers column, last click Next and then wait while the driver files load. When the driver has been successfully added click Finish to close the new window. 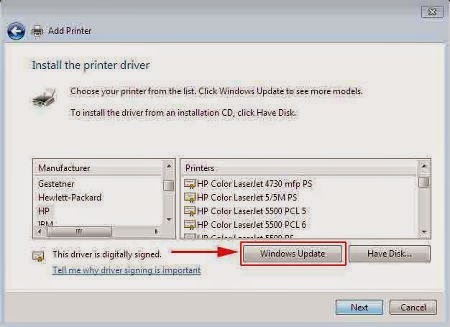 Connect the USB cable to the computer and to the printer, and then wait while Windows 7 detects the new printer and finishes installing it. The printer is now installed and ready to use on Windows 7. All-in-One printer uses monochrome laser print technology equipped black and white cartridge with print speed up to 14 ppm and resolution 600 x 600 dpi . This printer has a dimension of 43.7 x 36.3 x 30.8 cm and weight 8.5 kg so as to save space in your work space. Besides its primary function, M1005 also offers extra functionality ie copies and scans. Equipped with a processor speed of 230 MHz and 32 MB of memory makes it quite powerful in its job. This printer supports a wide range of media sizes are A4, A5, B5, C5, C6, DL, and postcard with various types, ie paper, labels, envelopes, transparancies, postcards and cardstock. For paper storage media it has provided the paper tray that can hold up to 150 sheets of paper. Hi-Speed USB 2.0 connectivity is used as a conectivity medium like most printers. Scanner used is Flatbed type that supports various file format are jpeg, gif, bmp, tiff and pdf with resolution up to 1200 dpi and a maximum scan size 21.6 x 29.7 cm. HP Laserjet M1005 MFP uses 230 Watts when in operation and 7 Watts when it is in standby mode and has been certified by ENERGY STAR. It's easy to use and in the box include a CD containing Full Feature Software and Driver for the printer. If your printer get message error message saying Scanner Error 6, Scanner Error 12, Scanner Error 100, Scanner Error 200, or Scanner Error 300 you must set the printer to factory defaults by reinstalling printer firmware. You can download it from link below.